An African buffalo at Ngorongoro Conservation Area, Tanzania. The African buffalo or Cape buffalo (Syncerus caffer) is a large African bovine. It is not closely related to the slightly larger wild water buffalo of Asia and its ancestry remains unclear. Syncerus caffer caffer, the Cape buffalo, is the typical subspecies, and the largest one, found in South and East Africa. 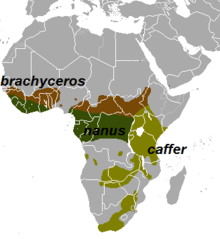 S. c. nanus (African forest buffalo) is the smallest subspecies, common in forest areas of Central and West Africa, while S. c. brachyceros is in West Africa and S. c. aequinoctialis is in the savannas of Central Africa. The adult buffalo's horns are its characteristic feature; they have fused bases, forming a continuous bone shield referred to as a "boss". They are widely regarded as very dangerous animals, as they gore and kill over 200 people every year. The African buffalo is not an ancestor of domestic cattle and is only distantly related to other larger bovines. 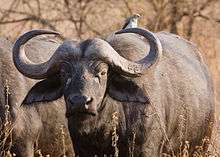 Owing to its unpredictable nature, which makes it highly dangerous to humans, the African buffalo has never been domesticated, unlike its Asian counterpart, the water buffalo. Other than humans, African Cape buffaloes have few predators aside from lions, and are capable of defending themselves. Being a member of the big five game, the Cape buffalo is a sought-after trophy in hunting. Syncerus caffer caffer (Cape buffalo or southern savanna buffalo) is the typical subspecies, and the largest one, with large males weighing up to 910 kg (2,010 lb). It is peculiar to South and East Africa. Buffaloes of this subspecies living in the south of the continent, notably tall in size and ferocity, are the so-called Cape buffalo. Color of this subspecies is the darkest, almost black. S. c. nanus (forest buffalo, dwarf buffalo) is the smallest subspecies; the height at the withers is less than 120 cm and average weight is about 270 kg (600 lb). The color is red, with darker patches on the head and shoulders, and in the ears, forming a brush. The dwarf buffalo is common in forest areas of Central and West Africa. This subspecies is so different from the standard model, some researchers consider it still a separate species, S. nanus. Hybrids between the typical subspecies and dwarf are not uncommon. S. c. brachyceros (Sudanese buffalo) is, in morphological terms, intermediate between those two subspecies. It occurs in West Africa. Its dimensions are relatively small, especially compared to other buffalo found in Cameroon, which weigh half as much as the South African subspecies (bulls weighing 600 kg (1,300 lb) are considered to be very large). S. c. aequinoctialis (Nile buffalo) is confined to the savannas of Central Africa. It is similar to the Cape buffalo, but somewhat smaller, and its color is lighter. 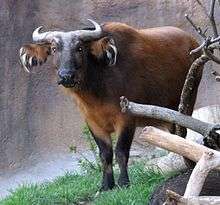 This subspecies is sometimes included in the Sudanese buffalo. S. c. mathewsi (mountain buffalo or Virunga buffalo) is not universally recognized. It lives in mountainous areas of the Democratic Republic of the Congo, Rwanda, and Uganda. The African buffalo is one of the most successful grazers in Africa. It lives in swamps and floodplains, as well as mopane grasslands and forests of the major mountains of Africa. This buffalo prefers a habitat with dense cover, such as reeds and thickets, but can also be found in open woodland. While not particularly demanding with regard to habitat, they require water daily, so depend on perennial sources of water. Like the plains zebra, the buffalo can live on tall, coarse grasses. Herds of buffalo mow down grasses and make way for more selective grazers. When feeding, the buffalo makes use of its tongue and wide incisor row to eat grass more quickly than most other African herbivores. Buffaloes do not stay on trampled or depleted areas for long. Other than humans, African Cape buffaloes have few predators and are capable of defending themselves against (and killing) lions. Lions do kill and eat buffalo regularly, and in some regions, the buffaloes are the lions' primary prey. It typically takes several lions to bring down a single adult buffalo, usually the entire pride joins the hunt; however, several incidents have been reported in which lone adult male lions have been able to successfully bring down adult animals. The average-sized crocodile typically attacks only old solitary animals and young calves, though they can kill healthy adults. Also, the Nile crocodile is the only animal that typically takes down adult buffalo alone, as pride attack is the preferred method of lions when taking down such large prey. The cheetah, leopard, and spotted hyena are a threat only to newborn calves, though spotted hyenas have been recorded killing full-grown bulls on rare occasions. Cows first calve at five years of age, after a gestation period of 11.5 months. Newborn calves remain hidden in vegetation for the first few weeks while being nursed occasionally by the mother before joining the main herd. Older calves are held in the centre of the herd for safety. The maternal bond between mother and calf lasts longer than in most bovids. However, when a new calf is born, the bonding ends and the mother keeps her previous offspring at bay with horn jabs. Nevertheless, the yearling follows its mother for another year or so. Males leave their mothers when they are two years old and join the bachelor groups. Young calves, unusually for bovids, suckle from behind their mothers, pushing their heads between the mothers' legs. The buffalo is listed as least concern by the IUCN "as the species remains widespread, with a global population estimated at nearly 900,000 animals, of which more than three-quarters are in protected areas. While some populations (subspecies) are decreasing, others will remain unchanged in the long term if large, healthy populations continue to persist in a substantial number of national parks, equivalent reserves and hunting zones in southern and eastern Africa." One of the big five, it is known as "the Black Death" or "widowmaker", and is widely regarded as a very dangerous animal, as it gores and kills over 200 people every year. Buffaloes are sometimes reported to kill more people in Africa than any other animal, although the same claim is also made of hippos and crocodiles. 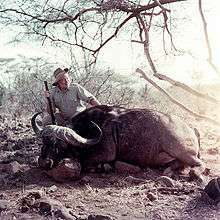 Buffaloes are notorious among big-game hunters as very dangerous animals, with wounded animals reported to ambush and attack pursuers. 1 2 IUCN SSC Antelope Specialist Group 2008. Syncerus caffer. The IUCN Red List of Threatened Species. Version 2014.3. Downloaded on 08 April 2015. ↑ Grubb, P. (2005). "Order Artiodactyla". In Wilson, D.E. ; Reeder, D.M. Mammal Species of the World: A Taxonomic and Geographic Reference (3rd ed.). Johns Hopkins University Press. pp. 695–696. ISBN 978-0-8018-8221-0. OCLC 62265494. 1 2 Huffman, Brent (2010-05-24). "Syncerus caffer – African buffalo". Ultimateungulate.com. Retrieved 2010-10-23. ↑ "BioLib - Syncerus caffer matthewsi (Virunga Buffalo)". biolib.cz. ↑ "Cape Buffalo". Canadian Museum of Nature. Retrieved 2010-10-23. 1 2 3 Turner, W. C.; Jolles, A. E.; Owen-Smith, N. (2005). "Alternating Sexual Segregation During the Mating Season By Male African Buffalo (Syncerus caffer)". Journal of Zoology. 267 (3): 291–299. doi:10.1017/S095283690500748X. ↑ Ryan, S. J.; Knetchtel, Christiane U.; Wayne, M. (2006). "Range and habitat Selection of African Buffalo in South Africa" (PDF). Journal of Wildlife Management. 70 (3): 764–776. doi:10.2193/0022-541X(2006)70[764:RAHSOA]2.0.CO;2. ↑ Main, M. B.; Coblentz, Bruce E. (1990). "Sexual Segregation among Ungulate: A Critique". Wildlife Society Bulletin. 18 (2): 204–210. JSTOR 3782137. 1 2 Sinclair, A. R. E. (1977) The African Buffalo. Chicago, The University of Chicago Press. ↑ Wilson, D. S. (1997). "Altruism and Organism: Disentangling the Themes of Multilevel Selection Theory". The American Naturalist. 150: S122–S134. doi:10.1086/286053. JSTOR 2463504. PMID 18811309. ↑ "African Buffalo". British Broadcasting Corporation. Archived from the original on 27 October 2010. Retrieved 2010-10-23. ↑ Prins, H.H.T (1996). Ecology and Behaviour of the African Buffalo: Social Inequality and Decision Making. Springer. p. 118. ISBN 978-0-412-72520-3. Retrieved 31 July 2013. ↑ Winterbach, H. E. K. (1998). "Research review: the status and distribution of Cape buffalo Syncerus caffer caffer in southern Africa". South African Journal of Wildlife Research. 28 (3): 82–88. ↑ Stumpf, Bruce G. "Africa on the Matrix: The Cape Buffalo". Retrieved 2010-10-23. ↑ "African Animals Hunting facts and tips – Buffalo Hunting". safariBwana newsletter. Retrieved 2010-10-23. "Buffalo, the name of two species of the true oxen". The American Cyclopædia. 1879.